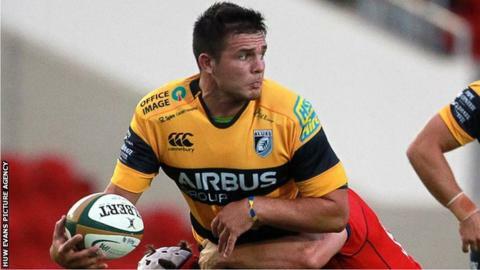 Ellis Jenkins is a Cardiff Blues captain in waiting and could also lead Wales one day, according to Blues coach Danny Wilson. Versatile back row Jenkins, 22, has signed a new contract with his region and has impressed Wilson with his natural leadership qualities. "He's a future captain, there's no doubt about that," said Wilson. "He's a player that, if he fulfils his potential, I'm sure he can go on to play at the top end of the game." Jenkins faces significant competition for his preferred openside flanker position at the Blues, with Wales captain Sam Warburton and Josh Navidi among the Arms Park ranks. Rhys Patchell has decided his future development lies elsewhere given his limited opportunities to play at fly-half, but Jenkins insists he is ready to embrace the challenge to fight for his place in the Welsh capital. "It's only a good thing for us, it'll drive us to be better players otherwise there's someone ready to take your shirt," he said. "The other boys feel the same about testing each other in training. It's about working as hard as possible to make your performance as good as possible on the pitch. "Sam [Warburton] has done so much and is still fairly young. He's a perfect role model to look up to. But my challenge is to be able to compete with him and Josh and that's what I'm going to try to do." Jenkins captained the Wales Under-20 side to the runners-up place at the 2013 Junior World Championship, beating South Africa in the semi-finals. He hopes to return from a knee injury to feature in the festive fixtures and Blues coach Wilson believes securing his services on a long-term deal could prove to be one of their most significant signings. "It's leading by example which he does in terms of the way he trains and performs, and also leadership in terms of decision-making and tactical appreciation," he said. "For such a young lad, he also has the ability to help others and understands the game really well. He's got all the credentials." Wilson revealed that Gareth Anscombe has stepped up his rehabilitation from the ankle injury that has ruled him out since Wales' World Cup quarter-final defeat by South Africa. No timescale was given for the fly-half's likely return, other than that it will be into the new year before the full-back or fly-half will play again. "He's slowing going to start back, to some running," said Wilson. "It's a little bit 'watch this space' on each stage he completes and hopefully he'll complete the next couple and be back for us sooner rather than later."